Our organization has a farm in Duale we use to raise crops...mostly casava. Currently we obtain about 15 tons of casava a year. This helps feed our kids, and we are able to make a small amount of profit to put back into running the farm. Many of our kids work here so it's great work training for them and their families! 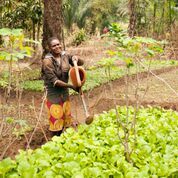 Your gift can purchase another acre of land for us to cultivate, thereby providing food and work opportunities for many in our community.